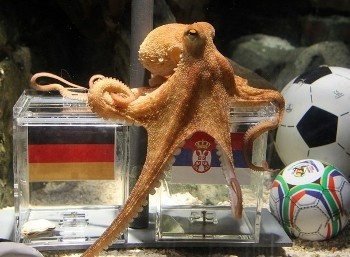 A German octopus named Paul is being hailed as the world's first and only cephalopod psychic. His specialty? Predicting Germany's wins and losses in 2010 World Cup. He's had 100 percent success rate, predicting Germany's win against Australia and Ghana and loss to Serbia. Paul has cast his prediction for this Sunday's game against England, and he's predicting a loss for the Three Lions. Scientists at the Oberhausen Sea Life Centre in Germany place two boxes, each with a mussel inside, into Paul's tank every time Germany will be going into a match. Each box has a flag of the opposing country on the front and Paul "predicts" the outcome of the match by choosing a box and settling inside of it. "He really strictly marched onto the Germany box and put himself inside. He was 100 percent sure this time," says Daniel Fey, a spokesman from the Sea Life center. There's only a 12.5 percent chance that Paul could have successfully predicted the outcomes of the past three matches. Those sound like good odds to me. I'll be right back, I need to call my bookie.